Arethusa 25.1, Winter 1992, ‘Reconsidering Ovid’s Fasti‘, $20. Bacchylides, a Selection, ed. H. Maehler, Cambridge ‘green and gold’ series, 2003, $20. Cicero, De Natura Deorum, Book I, ed. Andrew R. Dyck, Cambridge ‘green and gold’ series, 2003, $16. 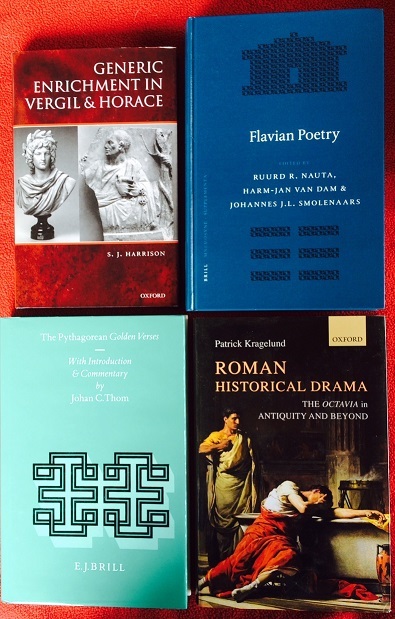 Flavian Poetry, ed. Ruurd R. Nauta, Harm-Jan Van Dam, & Johannes J. L. Smoleaars, Mnemosyne Supplement 207, Leiden, 2006, $90. 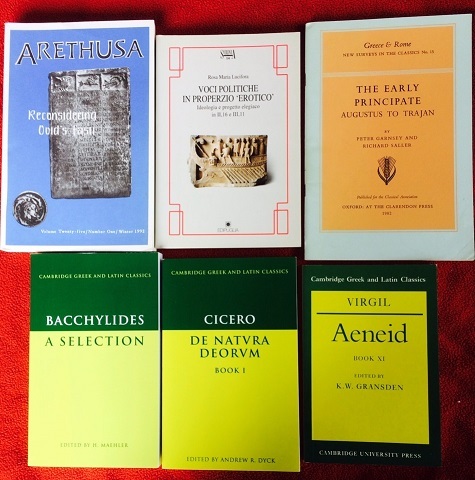 Peter Garnsey and Richard Saller, The Early Principate: Augustus to Trajan, Greece & Rome New Surveys in the Classics No. 15, Oxford University Press, 1982 (paperback), Very Good condition – a bit dingy, with a penciled price ($3.50) and some specks next to it on the title page, but the text is totally clean and unmarked. $6. S. J. Harrison, Generic Enrichment in Vergil & Horace, Oxford University Press, 2007 (cloth in dustjacket), $40. Patrick Kragelund, Roman Historical Drama: The ‘Octavia’ in Antiquity and Beyond, Oxford University Press, 2016 (cloth in dustjacket), $60. Rosa Maria Lucifora, Voci Politiche in Properzio ‘Erotico’: Ideologia e progetto elegiaco in II,16 e III,11, Bari, 1999, $12. The Pythagorean Golden Verses, with Introduction and Commentary by Johan C. Thom, Series: Religions in the Graeco-Roman World 123, Leiden: E. J. Brill, 1995, Fine condition. $240. If that seems like a lot, note that there are no copies available at any price on Amazon or ABE, and that if it were in print, that’s roughly what Brill would be charging for it. Virgil, Aeneid, Book XI, ed. K. W. Gransden, Cambridge ‘green and gold’ series, 1991, $12. To claim a book, e-mail me at curculio + at-sign + curculio + dot + org, or write a comment if you want the whole world to know your bibliographical wants and needs. Please note that they are not in fact faded, though the Thom in particular looks that way because of the particular shade of the dust jacket. I can try to take better pictures if anyone needs them. Presumably Garnsey/Saller is from 1982, not 1928. I know the G&R Surveys go back a ways … (although I can remember when they started).